So many ways to support! Your donations allow KYC to work with nearly 500 youth in our Center, and thousands more across the state, annually! We are able to connect them with vital resources that help build resiliency and reduce risk factors in youth who are struggling with identity issues, family discord, mental health problems, or the challenges of adolescence. KYC accepts gifts of stock and securities. If you would like to make such a gift, please call us or email us. We also accept items for use in our Center or for personal use by youth. Please view our wish list for currently needed items. ​Would you like to hold a fundraiser to support Kaleidoscope Youth Center? It takes a village, and YOUR support is vital to serving LGBTQIA+ youth in Ohio! If you're interested in donating proceeds from an event to KYC, please contact KYC ahead of time. We request that you get permission from KYC prior to the use of our name and/or logo . For more information, please email jen@kycohio.org or call 614-294-5437. Thank you for your interest in supporting LGBTQIA+ youth! Or Host a #25in25 Community Fundraiser by clicking here! EXPERIENCING A CRISIS? NEED HELP OR SOMEONE TO TALK TO? 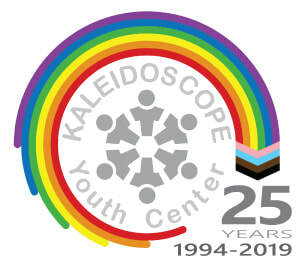 The Kaleidoscope Youth Center name and logo are copyrighted. All rights are reserved by Kaleidoscope Youth Center, Inc.